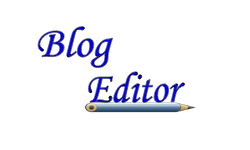 In this collection you can find thogayal recipes /chutney recipes for rice like Paruppu thogayal, Coriander leaves thogayal/Kothamalli thuvaiyal,pudina thogayal/Mint thogayal,Poondu thuvaiyal/Garlic thogayal,curry leaves thogayal/Karuvepilai thuvaiyal,Thengai thogayal/Coconut thuvaiyal,Pirandai thogayal,Karisilankanni thogayal,chow chow thogayal,radish thogayal & banana stem thogayal recipes for rice pepared by Tamil people. Thogayals/ Thuvaiyals are very popular among South Indians especially for Tamil people. 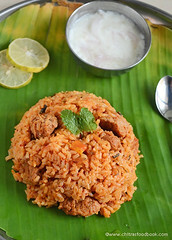 Some people like to mix with plain rice and eat and some loves to have it as a side dish for curd rice & sambar rice.In my family,everybody loves thogayal a lot.Everyday our lunch menu starts with a thogayal recipe.I came to know about varieties of thogayal recipes only after my marriage.Before marriage, my mom used to make thengai thogayal to mix with plain rice & pottukadalai thogayal as side dish for lemon rice and that too she makes it very rarely in weekends.But after marriage,when I tasted few thogayal recipes prepared by my MIL,it was very new and tasted delicious for me.My MIL makes all the thogayals perfectly with well balanced taste.The ratio of tamarind,salt and chillies are very important to make a perfect thogayal otherwise it will taste spicy or tangy.So whenever my MIL visits me, I tell her to make varieties of thogayal recipes like paruppu thogayal,peerkangai/ridge gourd thogayal,coriander thogayal,pudina thogayal,Poondu thuvaiyal,curry leaves thogayal and many more.I refrigerate them in an air tight box and enjoy it for more than a week.As Sendhil loves thogayal sadam a lot, I pack it for his lunch box too along with some stir fry/poriyal recipes.If I have few thogayals in hand,it is a big support for me as it makes the lunch box job much easier.In my blog, I have posted nearly 12 thogayal recipes for rice so far.It includes some healthy thogayal recipes like pirandai thogaya,Karisilankanni keerai thogayal as well.I wanted to have a collection of them in one post for my easy reference and for people who look for varieties of thogayal recipes for their daily lunch. I am yet to post few more like inji thogayal/ginger thogayal & peerkangai thogayal.I will share them in near future and add it here.Most of the recipes are without coconut.So you can grind,saute in oil and store them in refrigerator for more than a week too.I hope these thogayals would be very handy and useful for bachelors & working women who wants quick lunch or dinner.Do try these thogayal varieties for your lunch & lunch box.It tastes yummy.Do leave your feedback if u try any of these.I would be more happy.Thanks for visiting this page. Collection of thogayal recipes / chutney for rice - Varieties of thogayal/ thuvaiyal / chutney recipes for rice ! Gongura/Red Sorrel leaves in English,Ambadi in Gujrati,Marathi,Pitwa in Hindi,Pundi in Kannada & Pulichai Keerai in Tamil,Mestapat in bengali and Nalita in other languages is a very famous green variety in Andhra.Most of you would have heard about gongura pickle.But i tried thogayal with it years ago.Yes,this was the first & foremost recipe i tried after marriage from this website via google search.Recently a reader asked me to post gongura recipes and especially thogayal recipes.So after a long time,i referred that blog again and made this thogayal yesterday for rice.It was spicy,tangy n yummy when we had with hot rice and ghee.In the original recipe,it was titled as gongura pachadi/gongura chutney but i named it as thogayal because of its thick texture.Its very simple to make and you can store this thogayal for more than a week too.Even bachelor’s can try this and use it for 2-3 days without refrigeration.Soon i will share more gongura recipes like gongura sambar,gongura pappu in my blog and now lets see how to make this yummy Andhra style gongura thogayal for rice. Andhra style gongura thogayal recipe- Tastes yum with hot rice n ghee ! Wash the gongura leaves,drain the water and take in a pressure cooker base.Add green chillies,salt to it along with little water(Leaves will leave some water.So add little water) Pressure cook in high flame for 2 whistles.Open the lid and let it cool. Take out 2 green chillies & reserve.Grind the cooked mixture to a smooth paste.Check for taste and add the reserved chillies,grind again. In a kadai,heat oil and splutter mustard seeds,uradl dal,hing,curry leaves,red chillies & green chillies.Add finely chopped big onions and whole,peeled small onions and saute till transparent. Then add the ground paste and mix will till the mixture thickens and oil leaves from it.If needed add a tbsp of oil in the middle.Remove and let it cool.Store in a box and refrigerate. Mix with hot rice adding few drops of ghee. Enjoy ! Adjust the quantity of green chillies as per your spice level. Add a small piece of jaggery while grinding the leaves. You should saute till oil leaves from the paste and becomes thick.Else this thogayal will spoil soon. 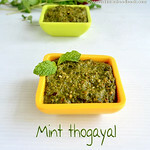 This thogayal stays good for more than a week if stored properly in refrigerator.Use a clean spoon while you handle. Enjoy mixing this yummy thogayal with plain hot rice adding few drops of ghee ! Brinjal Thogayal / Eggplant thogayal is one of the favourite thogayal recipes of our family.In my family, My in-laws and myself are big big fans of brinjal recipes. Sendhil & Raksha are just opposite to us.But they love to have very few dishes with brinjal.This is one among them.He loves Ennai kathrikai kuzhambu & this thogayal very much just because of pepper flavour.Yes,the flavour of pepper & garlic is the highlight of this thogayal and it makes the dish stands out.Generally people make thogayal by smoking the brinjal in flame and they call it as sutta kathrikai thogayal.But our entire family hates the smell of smoky brinjal,sounds strange right?? So i always burn the brinjal in microwave.By this way,brinjal gets cooked easily & there won’t be smoky smell at all.Follow whichever method u like.This thogayal tastes good in either ways! Lets see how to make brinjal thogayal for rice. Please check out my brinjal chutney for idli,dosa if interested ! Yummy brinjal thogayal for rice - Tastes best when mixed with hot rice drizzled with ghee! Soak tamarind in very little water.Wash the brinjals.Apply little oil all over the brinjal.Prick it with a fork in all the sides.Microwave it for 3-4 minutes turning it once in the middle.Check it for every 1 minute else it may burn. Peel the skin of garlic and coarsely grind it with pepper corns using a mortar & pestle.Set aside.Heat 1 tsp of oil in a kadai and fry the red chillies.Set aside.Peel the skin of cooked brinjal. In a mixie jar,take the cooked brinjals,tamarind,salt and red chillies. Grind it to a paste adding little water.To this lastly add the coarsely ground pepper+garlic mixture.Pulse it once and remove the thogayal in a serving bowl.Serve with hot rice & ghee ! You can use one big brinjal instead of 3 small brinjals. Increase the quantity of red chillies or pepper if u want more spicy thogayal. Adding ghee is a must while serving.It helps to balance the heat of pepper & brinjals. Do not over grind after adding the pepper+garlic mixture.Just give a pulse. Enjoy mixing this thogayal with hot rice drizzled with few drops of ghee ! Tastes yum ! As I mention in all my thogayal posts, my MIL is an expert in making thuvaiyal recipes. 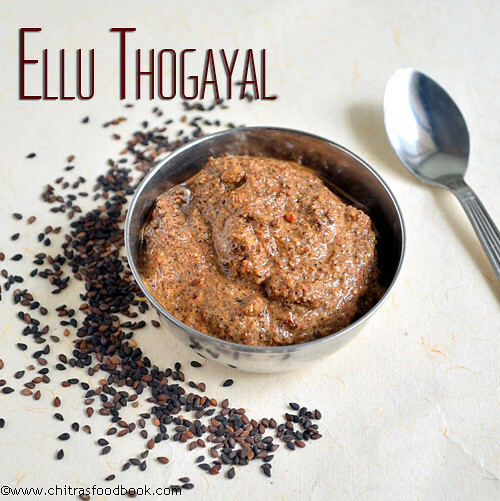 Thogayal is nothing but deeply spiced, tangy chutney for rice. My MIL used to make thogayal with almost all the greens and vegetables. Check this link for our varieties of thogayal recipes. 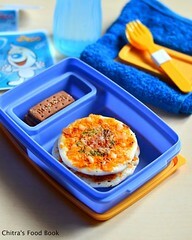 All are very easy to make and tastes delicious. I am very much thankful to her for teaching me these yummy varieties. We usually mix this chutney with plain rice topped with gingely oil. It also goes well with curd rice. Sendhil loves thogayals like anything. Mostly I pack 3 varieties of thogayal rice for his lunch box along with papad & buttermilk. He can happily have it for all the seven days too. My MIL usually says, for any thuvaiyal to be tasty, the secret lies in the quantity of red chillies & tamarind. Both should be balanced else thogayal may become either tangy or spicy sometimes bitter too. Usually urad dal is added for yield. It is completely optional. Do try this healthy karuveppilai thogayal recipe and let me know your feedback. Ok, let me move on to the recipe.. 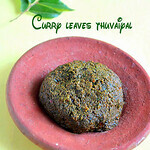 Check out my curry leaves gravy and curry leaves podi with the health benefits of curry leaves if interested ! 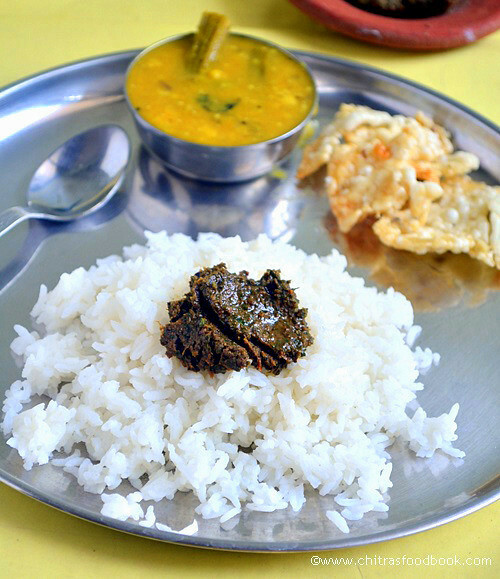 Curry leaves thogayal recipe to mix with plain rice - simple n yummy dish ! In a kadai,heat oil and roast the urad dal & red chillies.When dal turns golden brown, remove and set aside OR add curry leaves, simmer the flame completely and saute well till leaves shrink. Add tamarind, give a toss and switch off the flame. Grind it to a smooth paste adding jaggery &required water. Add less water while grinding to get a thick paste. ( sometimes I use mixie and sometimes with ammi kal / grinding stone based on powercut ) The main picture is the one ground using ammikal. 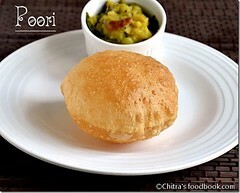 Enjoy with plain rice or curd rice !! Roasting curry leaves is a must otherwise it gives a raw smell. Adjust the quantity of chillies based on the spice level you need. Consistency of thogayal varies for grinding in mixie or ammi kal. U can make a very thick paste if you use ammi kal. Mix with plain rice topped with sesame oil and enjoy with vadagam !! Kothamalli thokku was in my try list for long time.Last month my in-laws were here.We had a nice time together.Whenever my MIL visits my house,i tell her to make some of her signature recipes like thogayal,pickles etc.One such recipe is this kothamalli thokku.She brought a big bunch of fresh coriander leaves from salem.We made kothamalli thogayal and this thokku.We enjoyed it for a week.It can be mixed with plain rice and also serves as a good side dish for idli,dosa mixed with gingely oil.Whenever i feel lazy to make side dishes for idli,dosa i keep this as accompaniment.Simple and yummy !! Wash & cut the coriander leaves roughly using scissors.Spread them in a paper overnight or in shade for 6 hours.If u are not able to do this,follow as given in next step.The point is coriander leaves should be dry without water content. In a kadai,heat oil and roast the chillies,urad dal and set aside. U can fry them separately or together.In the same kadai,saute the coriander leaves and tamarind pieces.Saute till it shrinks in quantity. First grind red chillies,salt .Then add the sauteed coriander leaves & tamarind ,jaggery without adding water.Lastly add the roasted urad dal and grind them together coarsely. Remove and store in an air tight box after it cools down. 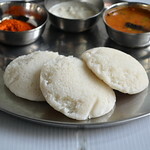 Mix with plain rice or serve as a side dish for hot idli,dosa topped with gingely oil.Tastes yummy. If u dry the leaves in shade,u don’t have to saute in oil.Just roast the other ingredients and grind everything together. Otherwise sautéing coriander leaves is a must as it should be dry without water content. Pinch the tamarind into small pieces and then saute.It helps to roast it well and also keep the thokku dry with long shelf life. It can be stored in an air tight box and can be had for more than a week without refrigeration.With refrigeration,u can keep it for more than a month too.Use a clean spoon every time. Technorati Tags: Kothamalli thokku recipe,kothamalli thokku,Kothamalli thokku for rice,Coriander leaves thokku,kothamalli recipes,Coriander leaves recipes. 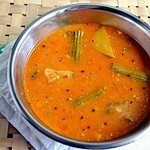 pazhang curry(mixture of left over sambar,kootu,poriyal) for lunch and enjoy the whole day in river banks. Nowadays only some people follow this practice. 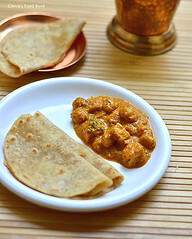 By sitting at home & watching all the special programmes on TV,we too can make our lunch very simple with this thogayal,sunda curry and papad .Hope u'll try this and enjoy your day.. 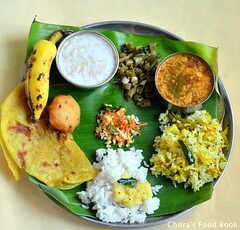 Wish u all a very happy and tasty pongal !! In a kadai ,heat 2 tsp of oil. Roast the urad dal,red chillies,hing. Lastly roast coconut along with these ingredients. Grind them coarsely adding salt and tamarind. Grind it thick without adding water. Coconut will be half ground. Now add very little water and make a thick paste. Remove in a serving bowl. 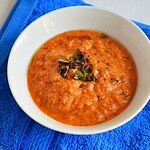 Enjoy mixing with plain rice adding sesame oil/gingely oil or have as a side dish for curd rice ! To get this nice color,use crushed red chilli.Otherwise u may not get the same color.U can find the chilli in the picture background. Adding urad dal is optional. If you add urad dal, you can use this thogayal as side dish for idli,dosa too. Mostly we make this chutney for travel. It stays good for one to two days without refrigeration if you roast coconut well. Adjust the amount of chillies and tamarind according to your tastebuds. U can also roast coconut at the end and add it while grinding which gives a nice flavor. This thogayal can be refrigerated and had for 2-3 days.